9.05% L&T Finance NCD – April'19 – Should you Invest? 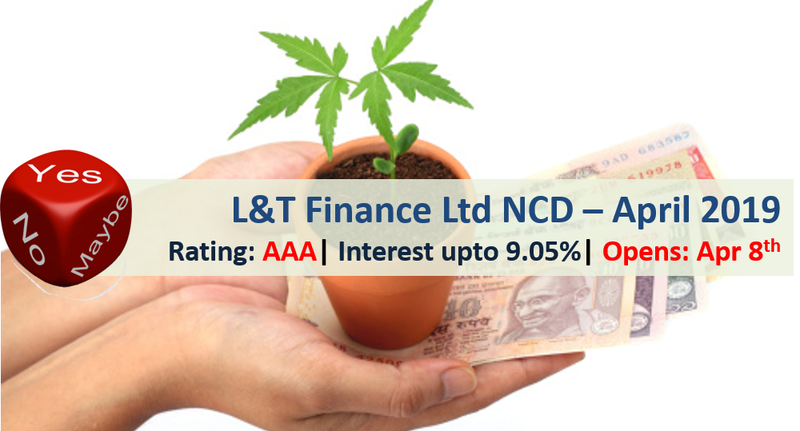 L&T Finance Limited is one of the leading private non-banking financial services companies in India and part of the larger conglomerate L&T Group has come out with public issue of non-convertible debentures (NCD) offering up to 9.05% interest rate (Tranche II). The issue would open on April 8, 2019. Its primary financing business segments are rural, wholesale and housing. There are 7 options of investment in L&T Finance NCD. L&T Finance NCD – Who can Apply? The interest rate seems to be coming down. Hence good idea to lock investment for long term. 11% Indiabulls Consumer Finance NCD – Feb’19 – Should you Invest?